I learned this recipe from my mother, who grew up in Turkey. 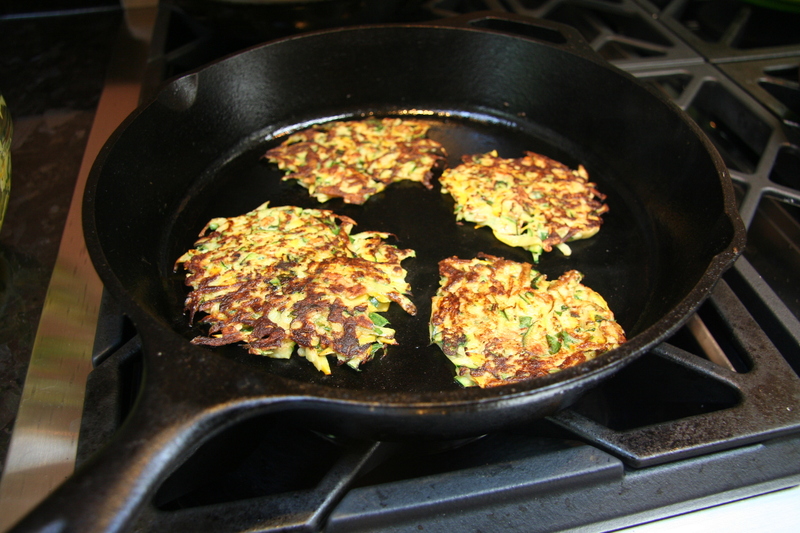 The biggest challenge with Zucchini pancakes is getting them to be more dry or crispy than soggy. This recipe produces a a very nice texture, although you can always bake them afterward to dry them out even more. Zucchini pancakes are typically served at room temperature, which makes this a good dish to bring to a party. 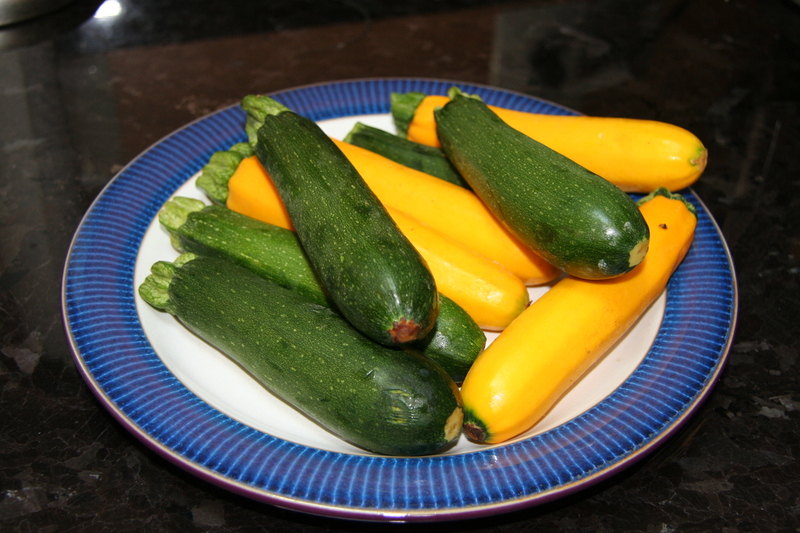 Try to select tender, young zucchini, but if that’s not possible (especially this late in the season), then cut the zucchini lengthwise down the middle and remove the seedy core with a spoon before grating. Although I’m normally a stickler for recipe quantities, this is one recipe where you really are better off going by “feel.” Especially since the moisture level of zucchini varies, as does the size of eggs. 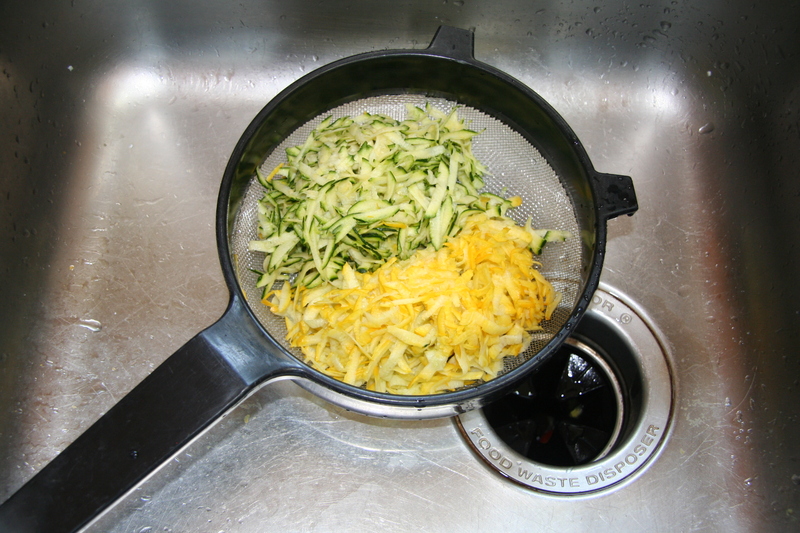 Place the grated zucchini in a colander or strainer. Generously season it with salt and mix. After a few minutes, the salt will start pulling the water out of the zucchini. Leave it to drain for 30 min or up to 2 hours. Then use your hands to squeeze any excess moisture out of the zucchini. Place the zucchini into a bowl. Heat up a cast iron skillet on medium heat. Although it’s tempting to want to use a non-stick pan, your pancakes will end up more soggy. Cast iron pans have a high heat capacity, which means that once they’re heated, they’ll retain their temperature much better than any other kind of pan, even when cold batter touches the pan. Plus, a properly heated cast iron skillet is semi non-stick already. When I’m done cooking a large batch, I never have to scrub my pan. Just a wipe with paper towel and the pan is clean! Sprinkle a few tablespoons of flour (or oats) into the batter and mix well. You’re not trying to make a “doughy” batter. You only want a light sprinkling that can soak up some of the excess liquid that will continue to seep out of the zucchini. You’ll see that as you cook your pancakes, the remaining batter in your bowl will get wetter and wetter. Next, beat and mix an egg into the batter using a fork. 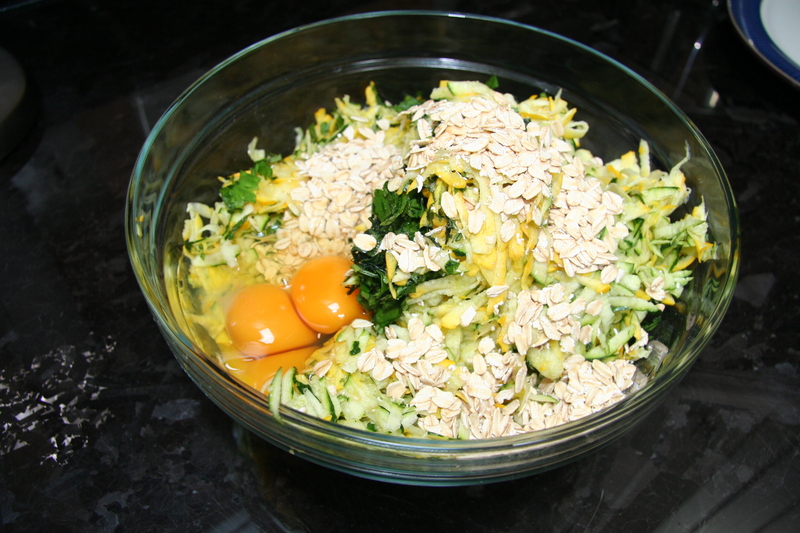 Add another egg or two, but only if you aren’t able to coat all of the zucchini with that first egg. Err on the side of fewer rather than more eggs. Finally, add in your chopped herbs and pepper. The batter is complete and should be used immediately. When the pan is hot, add enough clarified butter to coat the bottom of the pan. Using the same fork you mixed with (not a spoon – that way you leave the liquid behind) take a mound of the zucchini and drop it into the pan, then spread it out using pulling motions with the fork tines (as opposed to pressing/flattening with the back of the fork). They will not be perfectly round or have smooth edges, and there will be some holes in some of the pancakes, but that’s totally ok because that will make the pancakes crispier. After the edges are a bit brown, flip the pancakes with a metal spatula. Then when the other side is brown, transfer to a platter or a baking sheet if you want to keep them warm in the oven (this will also further dry them out, which is good). Mix the strained yogurt with some lemon juice and salt and serve alongside the zucchini pancakes. ← Are You Unknowingly Eating Spoiled Foods? GOOD WORK ..THEY ARE CALLED MÜCVER IN TURKISH CUSINE..